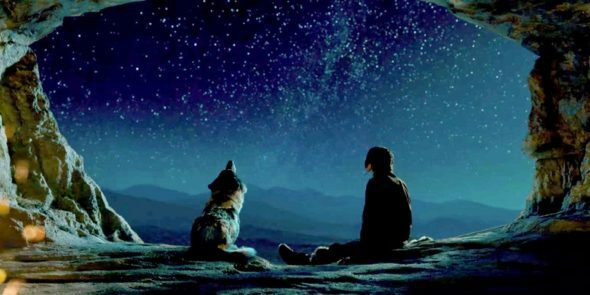 Visually stunning, but emotionally monotonous, Alpha seems like a planetarium show scaled up to feature length, given a sketch of a plot to justify shots of a human staring up at the firmament and trudging through various majestic terrains. Set 20,000 years ago in Europe, a hesitant young man, Keda (Kodi Smit-McPhee), sets out on his first hunt with the goal of making his dad proud. But when one of the beasts fights back, Keda takes a header off a cliff and is left for dead. What follows is his somewhat preposterous journey to get back to his settlement. It’s a little bit Cast Away, a little bit 127 Hours, with wide, sweeping shots of Keda’s journey that are very reminiscent of iconic scenes from the Lord of the Rings movies. For example, the hunting ground presumably is close enough to Keda’s settlement to allow the hunters to bring back the spoils before they, you know…spoil. And yet, on the way home, Keda climbs a few mountains, treks through a dessert, passes a swamp, skirts a volcano, and grows a delightfully thin adolescent mustache. For quite a time, he is doing this on a recently dislocated ankle and while carrying a full grown wolf. Cause, oh yeah, he’s got a wolf buddy who he basically domesticates on the way home. Billed as the heart of the story, Keda’s relationship with Alpha the wolf supposedly “shines a light on the origins of man’s best friend.” Given this, I was expecting the relationship to have a certain amount of complexity and emotional give and take. But this falls flat. The domestication happens so easily that it seems inevitable. I’ve adopted dogs that were harder to train. And despite the harsh environment and the occasional menacing hyenas, at no point do Keda and Alpha seem in any ultimate danger. All, in all, Alpha would probably be best viewed if you’re jonesing for an easy visual escape or if you want inspiration for upgrading your winter wardrobe. Cause those suspiciously healthy-looking folks eking out their existence during an Ice Age have some beautifully made clothes. Now, I’m off to search for a pair of leather pants online.